Magical Uses and History: The lore regarding the dandelion began in ancient China during the 7th century. The seed heads are used for a multitude of purposes including foreseeing how long you will live (number of seeds left after blowing), telling time (blow three times and the number left is the hour), sending messages to loved ones (blow the seed head in their direction and visualize your message), and, of course, to make wishes. The root of the dandelion is commonly used to make a tea which promotes psychic powers. This same tea can be placed beside the bed to call spirits. Medicinal Uses: Dandelion is a very power diuretic. Most diuretics cause a loss of vital potassium, but dandelion is one of the best natural sources of potassium making it a balanced diuretic that can be used safely when needed. It can also be used to treat inflammation of the liver and gallbladder as well as bring relief for common stomach problems. The milky latex from the stem can be used to treat warts. For water retention is can be used with yarrow. For liver and gallbladder problems it can be used with Barberry or Balmony. 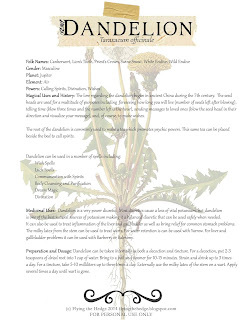 Preparation and Dosage: Dandelion can be taken internally as both a decoction and tincture. For a decoction, put 2-3 teaspoons of dried root into 1 cup of water. Bring to a boil and simmer for 10-15 minutes. Strain and drink up to 3 times a day. For a tincture, take 5-10 milliliters up to three times a day. Externally use the milky latex of the stem on a wart. Apply several times a day until wart is gone.